I am loving the way my son’s Spring tree art Project turned out! 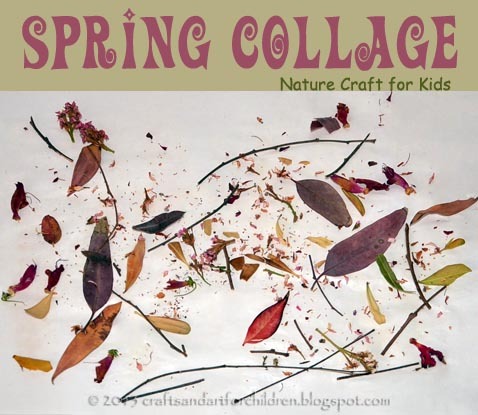 It was inspired by a pretty spring tree craft from Red Ted Art. It is made with items found in nature. We went on a short Nature Hike around our home to find items to create the crafts with. Big Brother used his bug catcher to collect items and Little Sister used her butterfly catcher. They only collected items they found on the ground instead of picking the beautiful parts still attached to the bushes, etc. Thankfully there was a ton of spring-colored flowers and leaves lying in teeny piles where they had fallen down. We only picked ones that retained their color even though they were dried up and yellow ones. The kids also found several twigs to use for the tree trunk. Using a big sheet of paper, they painted glue over the entire surface. At first, Big Brother was frustrated because his twigs weren’t staying down. The thinner ones with no curves in them work the best. He started to get to the point where he didn’t like what we were creating, so I had him start sticking the colorful pieces we had collected while I finished the trunk. This got him excited and he proudly exclaimed, “Mom, my tree is going to look so beautiful!” He loved choosing what pieces went where. 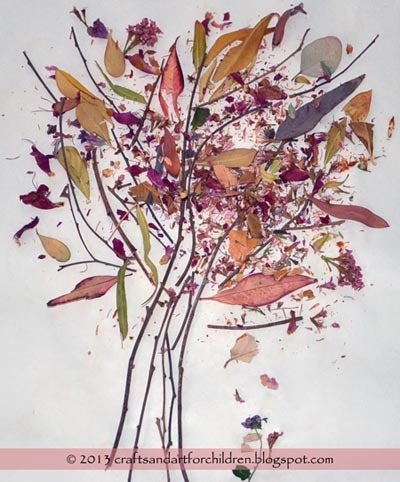 I also showed him how much fun it was to crumble some of the leaves and dried flowers in our hands, then sprinkle over the paper. My toddler girl made a Nature Collage. She was so content with putting things on and then taking them off again, LOL! I really like the way her craft turned out as well. What nature-inspired crafts have you made in the past? This is just beautiful! Thanks for linking to Share It Saturday. I&#39;ll be featuring your post tomorrow! Oh your son’s tree is GORGEOUS!